President Trump showed little concern for water protectors or Native sovereignty when he fast-tracked the Dakota Access Pipeline in spite of environmental concerns. Now he claims to support Native American sovereignty by promising to relax regulations so Native nations can dig up natural resources on their reservations and create jobs. To be clear, Indian Country is not monolithic its opposition to extractive industries that hurt Mother Earth. We wrote a piece April 5 titled: Indian Country is Divided on Mining Coal, Drilling for Oil; More Clashes Ahead. Yet Trump’s support for tribal sovereignty here seems dubious at best, a tool to support his pro-fossil fuel agenda. Trump made his comments today while meeting with state and tribal leaders. Rather than do more interpretation, here are his words directly from a White House transcript. …. I’m proud to have such a large gathering of tribal leaders here at the White House. I look forward to more government-to-government consultations with tribal leaders about the issues important to Indian Country. We love Indian Country, right? To shed some light on what “energy dominance” means, check out this chart. It shows that the United States is now a net exporter of finished petroleum products, including gasoline. 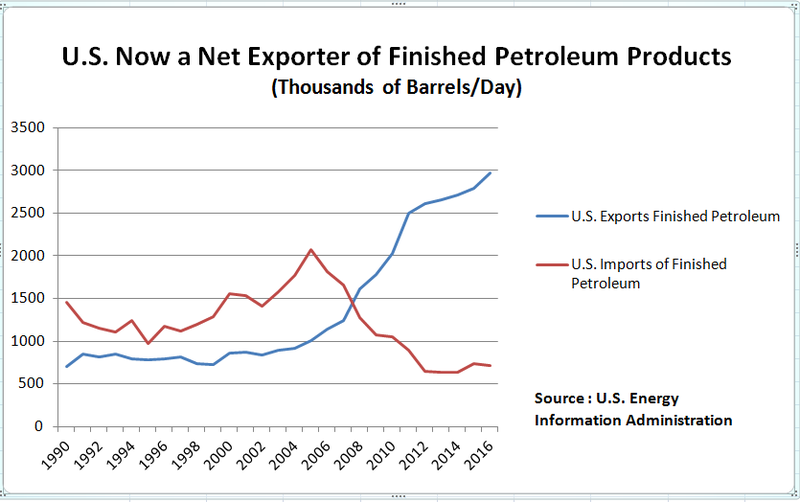 Yes, we still import crude oil, but we are importing more than we need for domestic use. The various pipelines proposals such as Keystone XL and the Enbridge Line 3 expansion through northern Minnesota are not about our own energy security, they are about increasing corporate profits from exporting energy. Read Trump’s full statement here.